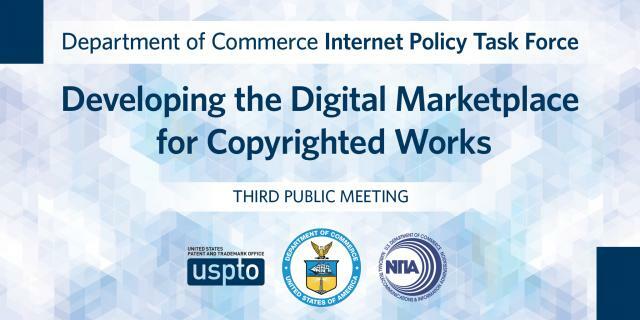 The Department of Commerce’s Internet Policy Task Force will host an all-day workshop Thursday, March 28, about the standards and tools that content producers use in the Internet age. The event will be held at the United States Patent and Trademark Office campus in Alexandria, VA, and will be webcast. The theme is “Developing the Digital Marketplace for Copyrighted Works.” Previous public meetings took place in January 2018 and December 2016. Initiatives to advance the digital content marketplace, with a focus on standards; interoperability, digital registries and database initiatives to track ownership and usage rights and facilitate licensing. Innovative technologies (such as blockchain, artificial intelligence) designed to improve the ways consumers access and use photos, film, music, text, and other types of digital content. Ways that different sectors can collaborate to promote a robust interconnected digital content marketplace. This event is open to members of the public on a first-come, first-served basis. Registration is free and doesn’t obligate you to attend, but space is limited so if you’d like to go take a moment to sign up. If you can’t be there in person, watch via a live webcast. The United States Patent and Trademark Office campus is located at 600 Dulany Street, Alexandria, VA 22314, and is roughly the same distance from the King St. / Old Town Alexandria and Eisenhower Avenue metro stations.